Good old drop sleeves. Since their glory days in the massive-shouldered 80’s, drop sleeves have been a bit neglected by designers, perhaps for good reason. Arguably, no other sweater shape is more associated with the cliché “unflattering hand-knit sweater” than drop sleeves. Basically, drop sleeves reduce a sweater to its most elemental: a big tube, with two little tubes attached to it at a ninety-degree angle. They can be fun, and easy to make, and they lend themselves well to elaborate color and cable patterns. But, flattering to the human form? Not so much. Until recently. I’ve been on the look-out for cute drop-sleeve sweaters ever since I finished my Davis this summer. With short-row shaping, a cropped length, and very slim little sleeves, this sweater manages to avoid all the pitfalls of the drop-sleeve sweaters of yore, looking polished and modern while still slouchy and casual. Browsing through Ravelry’s “Hot Right Now,” I noticed the list was littered with drop sleeves. They are back in a big way, as are boxy, 80’s shapes in general, and lots of designers are doing beautiful things with them. Bottom Right: Outlined by Suvi Simola, so seamless and elegant! PS If anyone reads Finnish and/or can find this pattern for me, I’d be eternally grateful. Maybe this is the Pacific Northwest talking, but I’ve always loved vests. I love how they fit nicely under jackets, and I love wearing them in the kitchen, and staying warm yet unencumbered by sleeves. Back when I worked at Verb, one of my favorite store samples was a wooly, farmy Cocoon Wrap, made of Bodega Pastures Worsted. 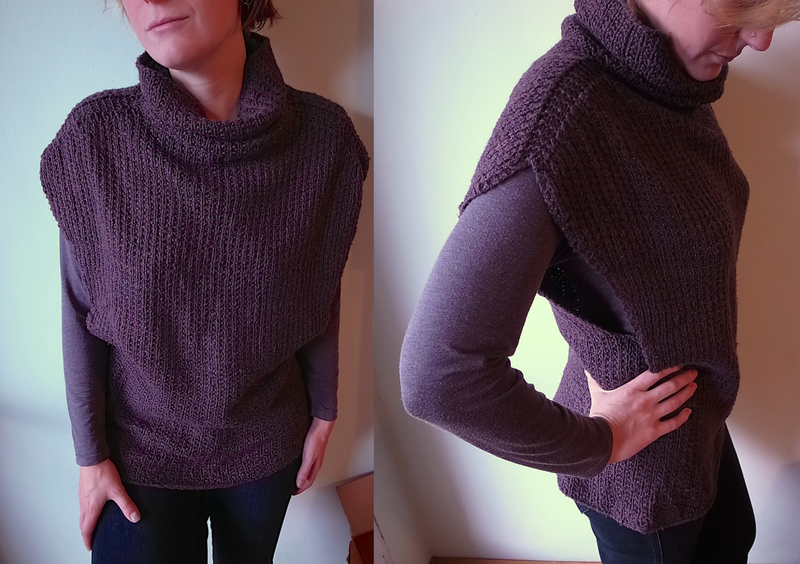 Kristine knit it, and in her wisdom made the collar out of Jade Sapphire washable cashmere. The wrap was big and neutral enough to be thrown over any outfit at all and look Mary-Kate Olson chic. 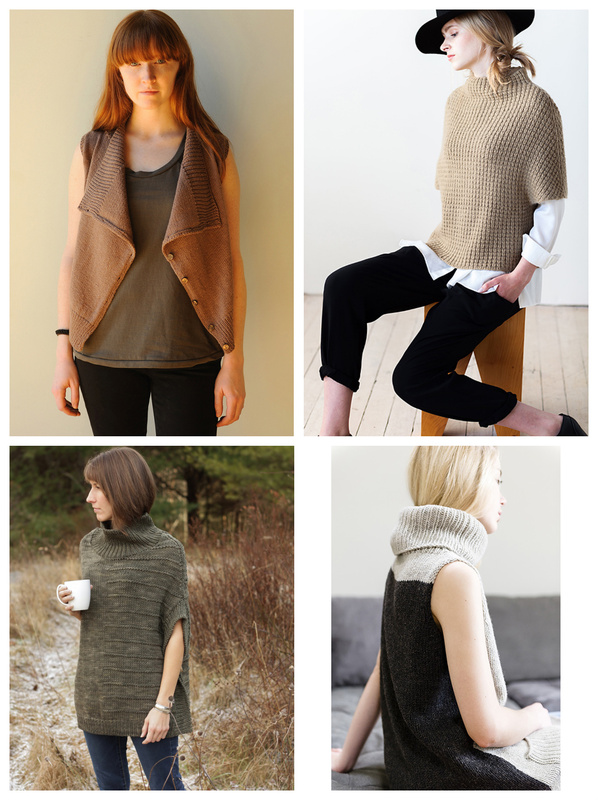 I needed a big, cozy vest of my own, and decided on Danforth in Fibre Co. Savannah. This vest delights Lorenzo, who says I look like Luke Skywalker when I wear it over black pants and a dark shirt. The recent turn of the weather got me thinking about my favorite vests again, all with lots of ease and cozy collars.